A few weekends ago, BeeBop and I decided it had been entirely too long since we’d seen the grandkids so we hopped in the car on Friday afternoon and headed for North Carolina. Normally when we spend the weekend with them, we either go to the park or visit one of the many kids’ activities in town, but this time we decided to spend the day at the Biltmore estate. If you’ve never been to Biltmore in Asheville, North Carolina, you’ve really missed a treat. Biltmore House, which opened in 1895, was built by George W. Vanderbilt and is situated on 8,000 acres of beautiful mountain land. It consists of 250 rooms plus acres and acres of carefully landscaped gardens. The day we visited was cold and windy. Very, very cold and windy, but we still had a wonderful time. When you purchase your admission tickets for the house, you receive an entrance time. Even though we purchased tickets in the morning, we could not tour the house until 3:45 that afternoon. Don’t worry, though, there’s plenty to do on the estate while you’re waiting for your house tour and lots of it is included in the admission cost. Of course, you can just drive through the miles of roads on the estate and enjoy the mountain scenery. Or during the summer months, you can can ride horses, rent a kayak, take a tour on a Land Rover, or go fly fishing. A fairly new addition is the Antler Hill Village where you can tour the winery. The wood working shop. BeeBop especially enjoyed all the antique wood working tools and equipment. Many of those haven’t changed much in the last century! The displays of antique farm equipment. This was an old hay rake, if I remember correctly. And the bee keeping equipment. The farm at Antler Hill Village is very kid-friendly and the staff really makes children feel welcome. I loved all the signs that read “Please Climb On Me!” A and Mag had a great time exploring this old farm tractor. In addition to the farm life displays, there is a barn and barnyard full of all kinds of animals and a staff of interpreters. A and Mag especially enjoyed the barnyard since the animals are free to roam around with the guests. We saw everything from chickens to horses to bunnies and goats. There are also several dining options at Antler Hill Village. We chose the bistro where they serve gourmet sandwiches and pizza from a wood-fired oven for lunch. And they have a great kids’ menu at the bistro in case you’re wondering. BeeBop and I both ordered soup and sandwich. I chose the Tomato Fennel Soup and it was just delicious! So delicious that I decided to try to recreate it when we got back home. My recreated recipe turned out great and I’ll share that with you at the end of this post. It was finally time for our house tour, so we headed back on the “approach road.” Even after all the times I’ve been to Biltmore, when you turn that final corner and drive through the gates, it’s always breathtaking. Even in the dead of winter it’s beautiful. But if you have an opportunity to go during the Spring, it’s incredible. No photography is allowed inside the house, but I did manage to snap a few outdoor shots while we were waiting in line. The workmanship and detail in Biltmore is unbelievable. Everywhere you look there’s something beautiful and interesting. to the hundreds of gargoyles both inside and out. A visit to Biltmore is like stepping back in time. If you find yourself near Asheville, North Carolina, make a free day in your schedule and visit the Biltmore estate. It’s an experience you won’t soon forget. Now, for that tomato-fennel soup I promised earlier. You start this soup by prepping some fennel and leeks. Clean the fennel, slice off the top and then cut the bulb crosswise into thin slices. Remove the dark green parts from the leeks and cut them crosswise as well. Separate the fennel and leeks into rings. Put them on a baking sheet, drizzle them with a little olive oil and then bake until the fennel is brown around the edges and some of the leeks are charred. Trust me on charring the leeks – it really does add a nice flavor to the finished soup. But if you just can’t bring yourself to char leeks, that’s okay. Cook them a little less time. While the fennel and leeks are cooking, put the rest of the olive oil in a large deep skillet over medium high heat. Add the tomatoes with all their juices and bring to a boil. Add the herbes de Provence, reduce the heat and let simmer. Next add all the veggies and the beef broth. Bring back to the boil, reduce the heat again and let it all simmer together for a few more minutes. Using either a hand-held blender, or a regular blender working in small batches, process the soup until it’s the texture that you like. We like this soup very thick and chunky, but you can process it as smoothly as you want. I kinda like seeing the little flecks of charred leeks and chunks of fennel in my bowl. If you want a thinner soup, I’d suggest just adding water rather than more beef stock since this soup is very rich. Garnish with some homemade croutons and tiny threads of fennel fronds. Gently separate the slices of fennel and leeks into rings. Place on a baking sheet and drizzle with 2 tablespoons of the olive oil. Sprinkle lightly with salt and pepper. Toss to coat all with the oil. Bake in preheated oven for 25-30 minutes or until fennel is browned around the edges and softened and some of the leeks are charred. Remove from the oven and set aside. In a deep skillet over medium high heat, add the remaining two tablespoons of olive oil and the tomatoes with their juice. Bring to the boil. Add the herbes de Provence and reduce the heat to a simmer. Cover and cook for 15-20 minutes or until the tomatoes soften and begin to break down. Add the beef broth, fennel and leeks. Cook for an additional 15 minutes. Using either a regular or hand-held blender, process the soup until it reaches the texture you like. Add water if needed to thin the soup. Garnish with croutons and fennel fronds. Terra, if you’ve never been to Biltmore you should take a day to do it! Really. And it does take a full day to really see the whole estate and the house. Hope you do it soon! Recreating memorable dishes that I’ve eaten at restaurants is one of my inspirations in the kitchen. One of these days I’ll get to Asheville and visit the Biltmore – until then, I have your deliciously chunky tomato fennel soup! It is fun, isn’t it, to get into your own kitchen and try to make a dish that you especially enjoyed in a restaurant! I don’t always get it right, but this one did turn exceptionally well, if I do say so myself :-) And I really hope you get to visit Biltmore one of these days. It’s unforgettable. That’s definitely a hay rake. We’ve been there several times and its always enjoyable. We usually combine a trip to Lake Lure/Chimney Rock since its only about 45 mins from there. That’s a great idea, Travis. There’s so much to do around Asheville! As you said, Lake Lure and Chimney Rock are right there, along with the beautiful scenery on the Parkway. Great place to spend a vacation. Thanks for the memories Lana; I loved visiting the Biltmore House when I lived in NC. And thanks for another tomato soup recipe…ever since venturing into making my own, I have not bought one can of Campbells; now THIS is umm umm good! No need for Campbell’s when making your own is so, so easy! So happy to remind you of Biltmore and here’s hoping you enjoy a nice pot of homemade tomato soup soon. What a fun day!!! Touring the south is definitely on my to do list – so many wonderful sites to visit and SO much amazing food to sample!! This soup sounds wonderful as well and right up my alley! I really need to invest in a hand blender. I don’t know why I haven’t done it yet–it would save me so much time! Oh, definitely! You’ll use a hand held blender so much more than the traditional kind. I really enjoy mine. Oh the Biltmore estate is so beautiful and all the museum-type visits are just what we love – this is so our kind of day. And that soup is fabulous! 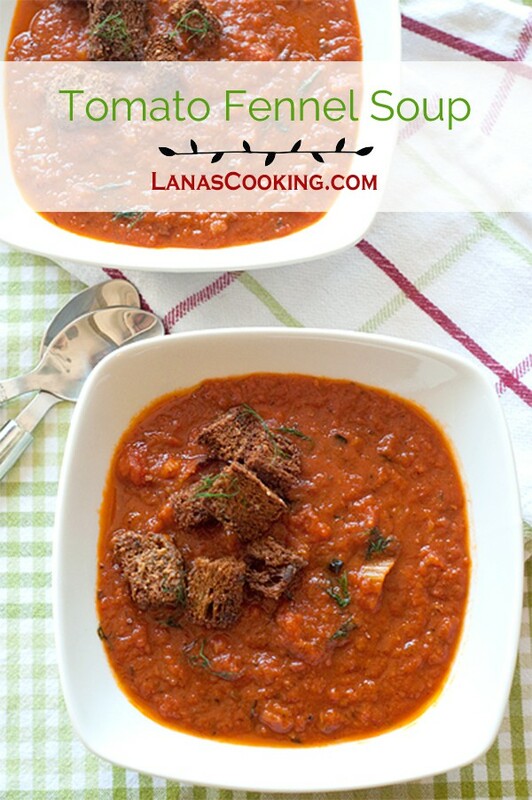 I absolutely love roasted fennel, love it, and adding it into a tomato soup is wonderful. I admire anyone that can taste a dish and then recreate it at home. Fabulous recipe! Great post, adorable grandkids! This is perfect! I’ve been loving fennel lately and can’t seem to get enough. How many oz are the tomato cans? That was three 14.5 ounce cans, Paulina.